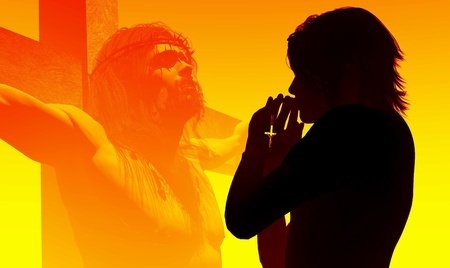 The Peaceful Revolution in the Name of Jesus Christ is a global Christian prayer movement that prays every day at the time Jesus died for us, 3pm (in our local time zones) as we meditate on the Passion of Christ. Who? All followers of Jesus are invited to join a Christian prayer movement that will change the world, one soul at a time. What? This is a revolution fueled by prayer and trust in Our Saviour Jesus Christ. We believe that only the power of God can silence the forces of evil in the world and create peace. We believe that prayer is the key to opening the Heart of God and that the Passion of Christ is the key to opening the human heart to understanding the greatness of God’s love. When? We unite in prayer at 3pm, in our local time zones, because 3pm is the time Jesus died for us and we believe the time of Our Lord’s death must be memorialized with prayer. Where? Pray wherever you are. Close your eyes and stand at the foot of the Cross of Jesus remembering how much Jesus suffered to save you. Come let us adore Him! How? Pray any way you are comfortable. Let the Holy Spirit guide you and help you to fall in love with your Saviour Jesus Christ. Why? On the night before Jesus died, Our Lord prayed for All believers that we may be ONE! Let us be ONE Body of Christ, united in prayer, in quiet contemplation of the Passion of Christ, as we repent and call upon the mercy of Our Lord Jesus upon all souls every day at 3pm, the time Jesus died for us. Imagine the POWER of a united Christian world praying together every day at the time Jesus died for us, 3pm, in our local time zones!